In contrast to my previous post, here is another photograph that I found on ebay titled "GREECE, Greek Children Among Ancient Ruins". If you wish to know what ruins are, look at this picture. All these blocks of stone were once put together in beautiful buildings. This was long, long ago. The buildings were made before Columbus sailed across the Atlantic Ocean. They were white marble. How they did shine in the sun! Think of the most beautiful building you have ever seen. Perhaps it is a state house, perhaps your postoffice. These marble buildings were far finer than that. Look at the carving on the block where these girls are sitting. Have you ever seen anything like it? Do you wonder what happened to make so many ruins? 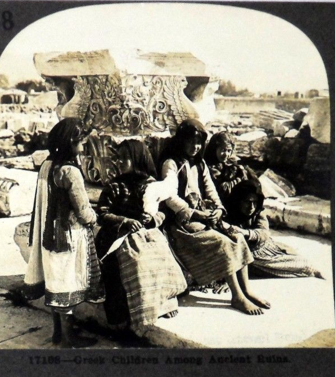 These Greek girls, who live near them, play among the white marble stones. They do not know who carved them nor how long ago it was. They bring their pets with them when they play among the ruins. Sometimes they bring their work. Some of their work is not like yours. You cannot spin. One girl has brought her spinning today. See the long stick in her hand. It is called a distaff. At the top is a bunch of wool. On a shorter stick is the thread she has twisted from the wool and would around the stick. Her mother will weave the thread into cloth. Perhaps, first, she will dye it some bright color that her big girl likes.